Harrisburg, in far western Nebraska, is distinctive in many respects. It is the only town in the county. Its school was the first county-wide K-12 district in Nebraska. And, although it is the county seat for Banner County, it was never formally incorporated. Despite its size, (less than 100 residents with not quite 1,000 in the entire county), Harrisburg is the site of one of the state's finest historical museum complexes, built and maintained by the Banner County Historical Society. In its early years, Harrisburg was a flourishing crossroads and the trade center of western Nebraska. 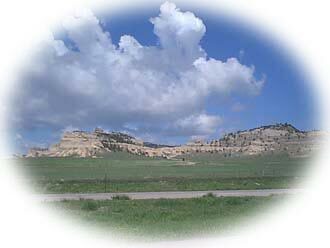 During the early 1890's, it was larger than either Kimball or Scottsbluff. Stage coaches traveling north or south made overnight stops in Harrisburg with as many as 75 travelers at a time housed in the two hotels. During that era, there were also three stores, two livery barns, a restaurant, saloon, and several other businesses. This area of fertile valleys and rugged, pine-covered ridges and canyons was a crossroads long before the pioneers arrived. Bands of Indians criss-crossed the area, following the herds of elk and buffalo. Among the earliest were the Comanches and Kiowas, then Arapahoes and Cheyennes, and finally the Sioux. Even the Pawnees made hunting forays into the Wildcat Ridge, until the Sioux pushed them back into eastern Nebraska. Harrisburg is near the geographical center of Banner County, which encompasses some 738 square miles. About 60% of the land is devoted to farming, mostly winter wheat, and the rest rangeland. The semi-arid, high plains climate makes for some of the best cattle-raising conditions in the world. Some of the largest early day cattle empires were headquartered here, among them the Bay State Cattle Company. In May, 1889, Charles A. Schooley laid out the town and called it Harrisburg, after his hometown in Pennsylvania. He donated land and then built a courthouse as a gift to the county. Today, despite its out-of-the-way location and diminished population, Harrisburg can boast, in addition to its unique museum, a new courthouse completed and all paid for in 1958, a modern fire department and rescue unit, a strong and progressive bank, two beautiful churches, several service industries, a fine school that fields excellent athletic teams, and some of the most friendly and neighborly people to be found anywhere.